Stomana Industry I Facilities - Corinth Pipeworks S.A.
Stomana Industry is Bulgaria's largest steel industry, with a commercial presence in SE Europe and in international markets. Stomana Industry joined Sidenor Group in 2001, after having been successfully in business for 50 years. Since then Stomana has been one of the most export-oriented companies of Sidenor Group, as it exports more than 90% of its production in steel plates outside Bulgaria, to more than 30 countries spanning over a wide geographical area (the Balkans, Europe, North Africa, America), and occupies consistently top positions in the suppliers’ list of many major international groups of steel products’ distribution. 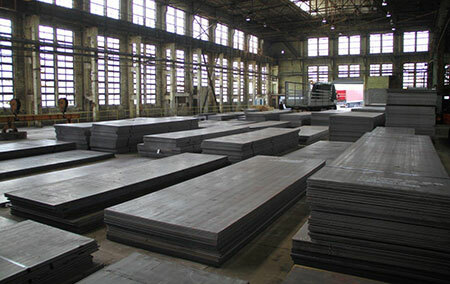 The plant of Stomana Industry manufactures steel products that meet the requirements of even the strictest international specifications such as EN, DIN, ASTM, JIS, BS, Lloyd’s Register and Germanischer Lloyd. Moreover, the plant applies an ISO 9001:2008 certified Quality Management System, a Quality Assurance System certified according to EN ISO 9001:2008, as well as an Environmental Management System certified according to EN ISO 14001:2004. Furthermore, STOMANA INDUSTRY SA recently applied an Occupational Health & Safety Management System certified according to OHSAS 18001:2007. SD concrete reinforcing steel, which stands out for its excellent strength and ductility, in accordance with the current requirements specified in Greek and European earthquake protection regulations.